1. 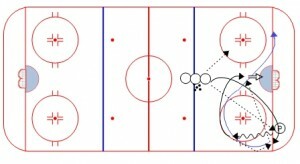 Coach dumps a puck in – first player goes into corner, picks up the puck, and cycles it back. 3. After cycling it back, the first player cuts across the top of the circle and drives the net – second player passes out for a one-time shot. 4. 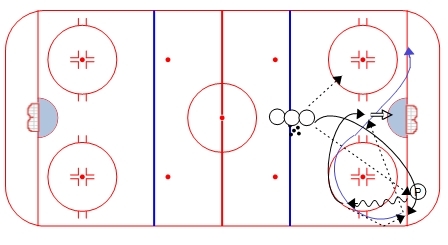 After the pass is made, the next player in line dumps it in the other corner. 5. The player who just made the pass continues up around the top of the circle, then drives into the corner to pick up the dump. 6. He cycles back, and the player who dumped it in supports to pick up the cycle. Same thing happens again. Drill continues perpetually.